Honeycrisp was first crossed in 1960 by researchers at the University of Minnesota. The variety is a cross between the Macoun and Honeygold apples (Honeygold is a cross between Golden Delicious and Haralson). The Minnesota researchers did many trials before selecting the final variety cross. Their research consisted of old-fashioned cross-pollination in which the pollen of the Macoun flower was brushed by hand against that of a Honeygold flower. By doing this the researchers not only discovered a grower friendly variety, but they also found a great-tasting apple that became a favorite of many American consumers. Honeycrisp was introduced to the commercial market in 1991. As Honey- crisp has gained fame and notoriety, more growers have begun planting the apple. Honeycrisp is exceptionally crunchy andjuicy, and its sweet-tart flavor makes it a great fresh-eating apple. 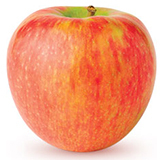 Honeycrisp is a medium-to-large sized apple, with a light green/yellow background largely covered with red-orange flush with strong hint of pink if grown in good sunlight. The skin may be flecked with occasional russet dots. The flesh is white, perhaps not quite as bright as a McIntosh style apple, but similarly crisp and not too dense. The colour however can be quite variable. This apple is hot! And mighty crisp. Combines unusual color and excellent sweet flavor with a great bite.